Doing Business in China 2019 is designed to introduce the fundamentals of investing in China. Compiled by the professionals at Dezan Shira & Associates, this comprehensive guide is ideal not only for businesses looking to enter the Chinese market, but also for companies who already have a presence here and want to keep up-to-date with the most recent and relevant policy changes. Now the world’s second largest economy and long since the most populous nation on earth, China oﬀers enormous opportunities for foreign companies, both as a manufacturing labor pool and, increasingly, as a consumer market of seemingly endless potential. In the 30 years since Deng Xiaoping’s “reform and opening-up” policy of 1978, China’s GDP has developed at an unprecedented rate, averaging 10 percent growth per annum. However, the relentless momentum of investors turning their sights towards China has softened of late. While some of these fears are grounded in reality, others are overblown. After decades of rapid growth and development, the Chinese economy is inevitably changing. The Middle Kingdom is undergoing a major overhaul, transitioning to have a service and consumption driven economy rather than one based purely on manufacturing and export. This transition is not unconditionally negative for the country’s competitiveness, and is understandably changing the way in which investors approach and operate in the country. Designed to introduce the fundamentals of investing in China, this publication is compiled by the experts at Dezan Shira & Associates, a specialist foreign direct investment practice, providing corporate establishment, business advisory, tax advisory and compliance, accounting, payroll, due diligence and ﬁnancial review services to multinationals investing in emerging Asia. 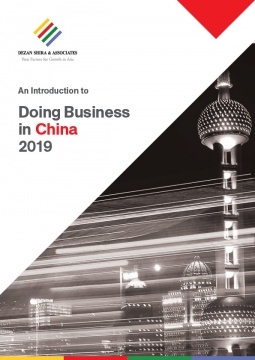 Within these chapters, we discuss a range of different topics that affect doing business in China, including investment models, intellectual property considerations, key taxes applicable for foreign companies, and various types of employment contracts. In addition, we examine how a foreign entity can convert its representative office (RO) into a wholly foreign-owned enterprise (WFOE), and discuss how to legally terminate an employee in China.